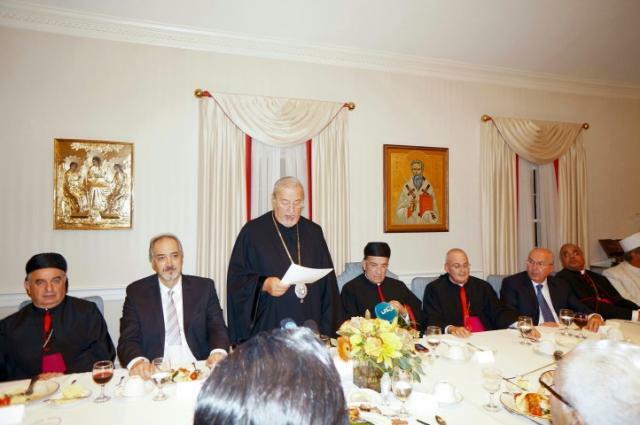 As part of his ongoing visit to the United States the head of the Maronite Catholic Church, Patriarch Beshara Rai of Antioch, has attended a reception in his honor hosted by Metropolitan Philip (Saliba) of the Antiochian Orthodox Archdiocese of North America and attended by th e Archdiocese's auxiliary bishops as well as several Maronite Catholic hierarchs and Muslim ulama (clergymen). More here. Update (29/10/2011): The next day Metropolitan Philip, Metropolitan Mor Cyril (Karim) of the Syriac Orthodox Archdiocese of the Eastern United States, and Antiochian Orthodox auxiliary Bishop Antoun (Khouri) of Miami attended the Sunday Liturgy celebrated by Patriarch Bechara at the Maronite Catholic cathedral in Brooklyn. More on that here.